The Moss Auction Team is a full-service professional auction company owned and operated by Larry and Matthew Moss in Paris, Illinois. We conduct various types of auctions in an ethical and honest manner using both traditional and innovative methods. Using the auction method of marketing, we bring sellers and buyers together to reach a fair market value for the property or goods being sold. The Moss Auction Team has more than 40 years of combined experience in the auction industry and can conduct auctions of any size. We specialize in real estate, agricultural equipment and personal property. 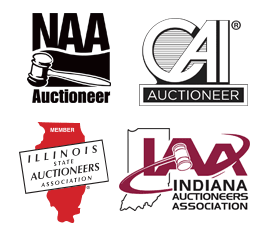 We believe that a good auction does not just happen. For an auction to be successful, it needs two important ingredients: preparation and promotion. Through careful preparation and customized promotion, we work hard to produce the best possible auction for you. Our goal is to sell your property or goods at a reasonable cost in an ethical and professional manner. We will complete your auction in the shortest time possible with the least inconvenience to you. By promoting your auction through traditional advertising methods as well as our Internet web site, we attract serious buyers to your auction, producing maximum results. Our computerized multiple-parcel real estate auctions give buyers the opportunity to purchase any number of parcels they desire, while you receive the highest fair market value for your property. We also provide conventional on-site auctions with our mobile sound systems and office trailer. The Moss Auction Team offers a unique cashier system for non-real estate auctions. This system allows you to receive a “guaranteed check” after the auction has concluded. We also provide you with a detailed record of the property or goods sold and a list of registered buyers for your personal use. If you are thinking about having an auction, call for a consultation at your convenience with no obligation and the strictest of confidence. We take great pride in preparing a successful auction and will follow through until every detail is complete before and after the auction. If you have property or goods that you wish to sell and turn into cash, let the Moss Auction Team work for you. We will use our experience and professionalism to deliver the results you want.